Guatemala’s indigenous communities have worked tirelessly to recuperate their communal lands in the 20 years since the end of the country’s 36-year-long internal armed conflict. But these communities have faced the constant threat of dispossession from mining companies, the large-scale agro-industry, and the construction of hydroelectric dams. In February 2017, the Guatemalan Constitutional Court issued their final decision on one dam-related conflict along the Cahabón River. The court ordered immediate suspension of the Oxec and Oxec II dams along the river pending the fulfillment of the consultation of residents of the municipality of Santa María Cahabón, the region expected to be impacted by the dam. 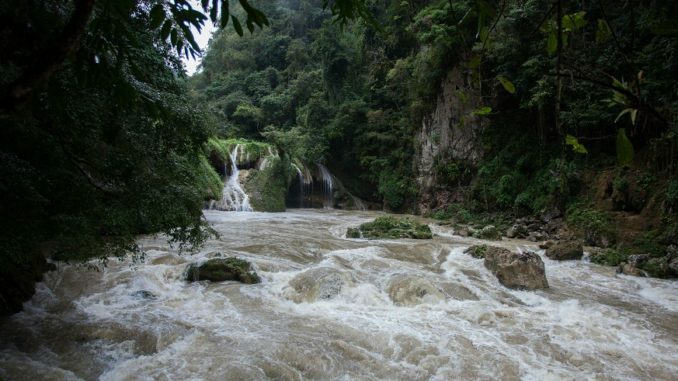 The court’s decision upholds an earlier decision in 2016 where the Guatemalan Supreme Court suspended the license for dam construction, and ordered a consultation of the 29,000 residents along the river. The consultation was originally slated for July 31, 2016, but the company filed an appeal just days before the consultation was to be held, delaying it until an unknown date. Meanwhile, the dam projects moved forward. In response residents called for a consultation in “good faith,” but this was quelled just days later when the Guatemalan government of right-wing President Jimmy Morales deployed police and military forces to stop the community from holding the consultation. The Guatemalan Ministry of Energy and Mining issued permits for the 25.5-megawatt Oxec dam, and the 45-megawatt Oxec II dam along the river in 2014. The company, Hidro Oxec S.A., which is owned by the Bosch Gutiérrez family, received a 50 years permit for the river. The Spanish company Cobra Group, owned by Florentino Pérez, the president of Spanish soccer team, Real Madrid, is constructing several of the projects along the river. The communities are now waiting for the state sanctioned-consultation to be held to decide the fate of the hydro project. Just weeks before the court made their 2017 announcement in favor of the residents of Cahabón, another community in resistance to the expansion of hydro energy received a major victory. On December 23, 2016, Hidro Santa Cruz, the subsidiary of the Spanish firm Ecoener–Hidralia, issued a press release announcing their decision to abandon the construction of the Santa Cruz hydroelectric dam in the Santa Cruz Barillas region. The company stated their decision was based on the levels of social conflict that had plagued the project since it was first announced in 2009. The project was met with constant protests by residents, and was accompanied by the criminalization and repression of anti-dam activists. Whether or not the project leaves for good, the decision to abandon the project sets a precedence for the value of resistance to the expansion of projects. But as Guatemala Sociologist Gladys Tzul Tzul points out, the region is still impacted by other major social conflicts over hydro, such as the project in San Mateo Ixtatan. January 17 of this year was a day of peaceful protest against the construction of the hydro electrical facility in the Chuj Maya community of Yixquisis in the municipality of San Mateo Ixtatan. Concerned residents mobilized to demand that the company, Proyección de Desarrollo Hídrico S.A. (PDH), leave their community. But the day would come to a tragic end when paramilitary members associated with the hydro company opening fire on protesters, striking 72-year-old Sebastián Alonzo Juan in the head. He would eventually die from his injuries. Members of the region’s indigenous authorities denounced the assassination, and called for an immediate investigation into the murder. “(The Plural National government) expresses its deep indignation at the constant aggression of transnational corporations that do not do more than provoke death by imposing a state of war and killing peaceful and defenseless people who seek peace alone,” wrote leaders of the region’s ancestral authority, known as the Plural National government, in their statement to the press. The ancestral authority represents the Akateko, Chuj, Q’anjab’al, and Popti’ Mayan communities of the region. “We demand the immediate thorough investigation of the murderers of Mr. Sebastian Alonzo Juan who was an advocate for the individual and collective human rights of the Chuj nation,” the leaders stated. They added their demands for the immediate withdrawal of the projects within the territory. Following the assassination, leftwing members of the Guatemalan congress launched a campaign to investigate the murder. But as the investigation begins, the most recent death in the modern conflict over expansion of energy expansion brings back the tragic memories of the past. Guatemala is currently undergoing the massive expansion of energy generation. The Guatemalan Ministry of Energy and Mining and the Inter-American Development Bank have announced that Guatemala will double energy production by 2025. The plans for such an expansion have been in place since the 1970s, and extends previous development plans such as Plan Mesoamerica and regional free trade agreements such as the Central American Free Trade Agreement. At the heart of the plan is Washington’s long-term plan of the integration of energy systems across Central America and Mexico. Today energy expansion is at the heart of the Alliance for Prosperity, which was proposed in early 2015 by US Vice President Joseph Biden. The plan was proposed as a means to combat the northern migration of undocumented migrants from the region following the crisis of unaccompanied minors from Central America in 2014. According to the Obama administration, which developed these policies, the 750-million-dollar aid package for the Northern Triangle of Central America, as well as millions for Mexico and Nicaragua, is meant to generate foreign direct investment, and strengthen security. Energy expansion in Central America takes a central place within the plan presented for the Alliance for Prosperity. The integration of the region’s energy networks were listed within the readouts of calls between the Obama White House and the Presidents of the northern triangle. It was also listed as a key part of the White House’s 2015 Strategy for Engagement in Central America. The modern struggle along the Cahabón River takes place in the same area where the World Bank and Guatemalan State sought to build a mega-dam as part of the energy development plan during the country’s 36-year-long internal armed conflict. The plan included 3 hydro projects: the 360 megawatt Xalala dam on the Chixoy river in Quiche, the 300 megawatt Chixoy dam on the Chixoy River in Baja Verapaz, and the 440 megawatt Chulac dam on the Cahabón in Alta Verapaz. The Chixoy project was the only dam to be completed during this time. But due to the weak condition of the rock base along river, the Cahabón could not support a dam of this scale. The project was scrapped in 1993. As the conflict raged in Guatemala in the 1980s, indigenous community members linked military violence to the dam construction attempts in the area. Extreme levels of violence marked the projects in the 1980’s. The well-known case of this tragedy is the massacres along the Chixoy River during the construction of the dam. The Guatemalan military between 1981 and 1984 massacred over 600 indigenous Achí residents along the river. The military justified these massacres by claiming there was a guerilla presence within the communities. In response to the massacres carried out by the Guatemalan military, the World Bank declared that they would never permit another project to advance that had such a high human cost. The United States government also denounced the massacres, and maintained a requirement for repatriations to the survivors as a basis for international aid to Guatemala. But as the Guatemalan military was attacking the Achí communities along the Chixoy River, the military was also carrying out massacres in the 1980s along the Cahabón River. Between 1980-1982, the military massacred residents of 14 communities along the Cahabón River. According to Bernardo Caal, a leader in the movement to protect the Cahabón River, in one massacre the military used a natural bridge over the river to execute residents they accused of guerrilla activity. The massacre occurred near to where today the Oxec II project is being constructed. “In the 1980’s, where they are installing Oxec II, there is a natural bridge where the military massacred residents,” said Caal. “[The operation also] utilized helicopters to bomb the area. The [military was] clearing the area for projects like these.” After shooting the community members, the military threw the victims’ bodies into the river. In the minds of residents there is a link between the massacres and the construction of the mega-dam. “They were clearing the way for the dam,” said Caal.